ENTER TO WIN YOUR FREE COPY! a FREE copy of my book! Fired-Up Fundraising: Turn Board Passion Into Action shows nonprofit leaders how to introduce reluctant board members to fundraising in ways that make them feel comfortable. Here are the secrets to inspiring and motivating your reluctant board members. Gail Perry’s best-selling book offers a new, very practical approach that both empowers and motivates your board members. Fired-Up Fundraising will help your board members get over their fear of fundraising, invigorate your fundraising effort, and create enthusiastic board members who are developing new friends and donors for your organization. This book can transform your board from “bored” to “blazing.” The approach that Gail lays out in this book is wildly popular with board members and staff alike. Fired-Up Fundraising will invigorate your fundraising effort, creating enthusiastic board members who are developing new friends and donors for your organization. I have to give you a testimonial… I tried something new to evoke my board members’ passion for the cause. I asked them: what legacy to you want to leave from serving on this board? Well, you would have thought I had opened the flood gates. One of the Executive Committee told a very poignant story of his cousin dying in hospice . . . This was the best meeting we’ve had so far on with this group in the last 3 years I’ve been here. Thanks for your wisdom and support! This ain’t brain surgery, but it surely helps to be able to refer to a level-headed practitioner who literally wrote the book with practical advice! Your book is beautifully written and has been an excellent guide for me. Thanks for keeping the flame burning brightly. 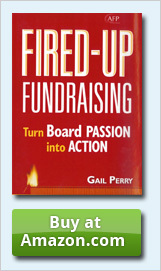 I have just finished reading your book, Fired-Up Fundraising. Your refreshing approach in laying out the basics and showing them to those of us who have seats on a board but don’t fully understand the needs of our organization is a voice that should be heard by all. Again, many thanks for the enlightenment! Bill SmithTreasurerHistoric Hope Foundation, Inc.
Gail Perry’s book, “Fired-Up fundraising…Turn Board Passion Into Action,” is a MUST READ book for all folks who want to develop a real passion for raising money for causes that we care about, with more energy… This is a user friendly book. It should be on every book shelf for research and Development of fund raising. To read an excerpt of the book, click here! “What people are saying about “Fired-Up Fundraising” – read more!